The What: At ISE 2019 (Stand 3-B150), the SDVoE Alliance will debut what it says is the world’s first implementation of HDMI connectivity within an Ethernet switch. The What Else: The solution features HDMI input and output modules that plug directly into a NETGEAR M4300-96X 10G Modular Managed Switch, with the aim of eliminating the need for standalone encoders and decoders to support in-rack video sources and destinations. The Bottom Line: To take complexity out of AV-over-IP deployments, NETGEAR created the SDVoE-ready M4300-96X Modular Managed Switch that is preconfigured for AV and multicast “Zero Touch” network configuration. 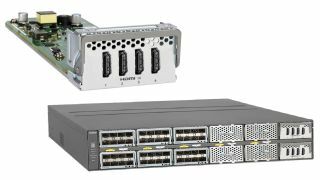 Users select the combination of HDMI, copper, PoE+, and fiber M4300-96X port expansion cards that fit requirements, insert the cards, connect SDVoE encoders and decoders, and power on the switch. SDVoE systems with symmetric input-output configurations are supported such as 48x48, but asymmetric solutions such as 24x72 are just as easily accommodated.